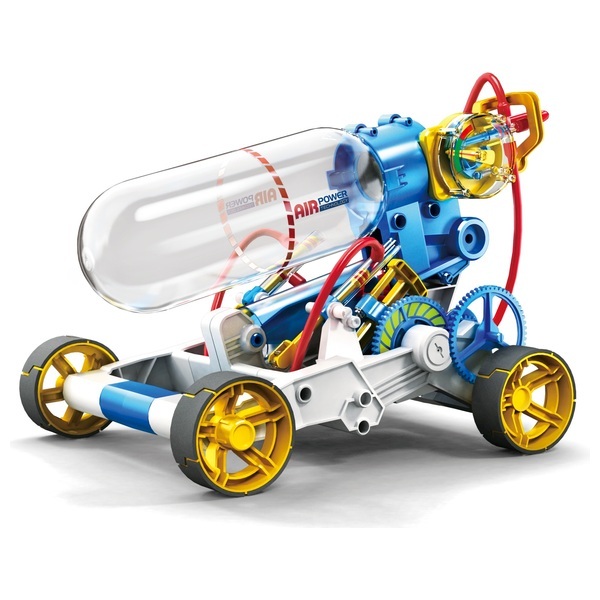 Build your own Air Power Engine Car with this Air Power Engine Car Kit.Assembly and operation is a breeze. A pump-up bar with a pressure meter is built into the car for easy operation. This meter measures the volume of compressed air. The air chamber made from PET (polyethylene terephthalate). The silicon tube (red in color) creates an air tight fit. Another safety device implemented into the kit is a safety valve. If the user keeps pumping while the tank is full, the safety valve will open and bleed the air automatically.. When the air chamber is full, you can release the compressed air; the air then expands and drives the vehicle a distance up to 50 meters in 35 seconds. The car is fast and furious fun that requires no batteries or specific weather conditions to limit its usage. Air Power Engine Car is not only designed with the environment in mind, but is also fun and easy to build!